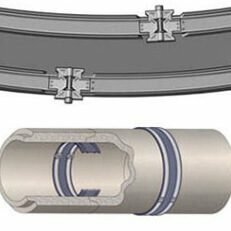 The NPC Internal Joint Seal economically eliminates groundwater infiltration from offset, corroded, cracked or deflected pipe joints and manhole barrel joints. The Internal Joint Seal prevents infiltration by bridging the joint with a flexible rubber seal and compressing the rubber against the pipe wall using the unique WedgeLock Expansion Bands without expensive special tools. The NPC Internal Seal is extruded from premium quality rubber and is available in three widths. The 7.5 inch seal is wide enough for most joint repairs. If the leaking joint is offset or deflected the 10.5 inch seal provides a wider sealing area. An extension is available for sealing even wider areas.